1. February 2019. Welcome to Tokyo’s glitzy Ginza district, home to mega brand boutiques, high-end jewelry stores, disgustingly expensive hotels and only slightly less disgustingly expensive cocktail bars and a la carte restaurants. Sounds f***ing awful right? Well yes, but Ginza isn’t a total write off if you know where to look. I came here with my accomplices Wonderboy and Rich on a late Tuesday afternoon and was pleasantly surprised by what we unearthed. 2. February 2019. 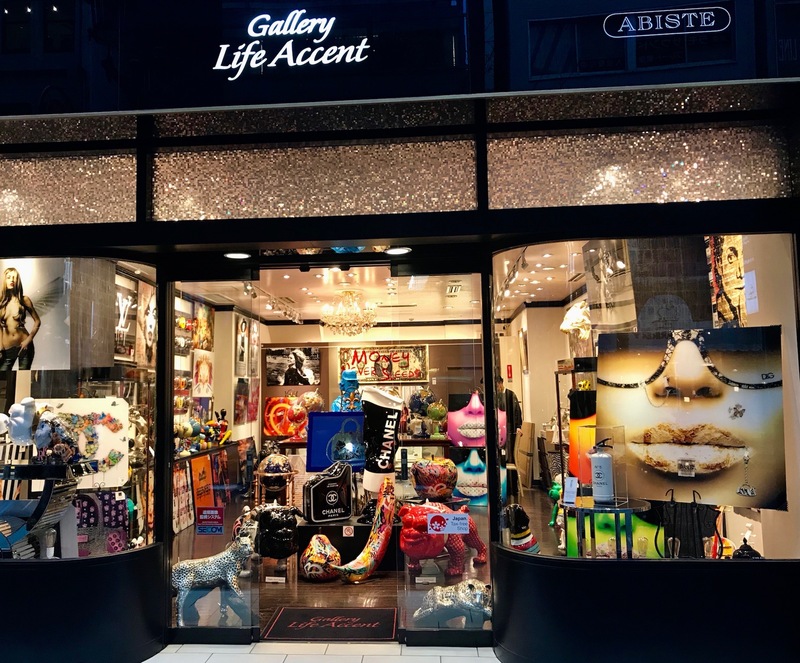 If you’re into art and wanna see something a bit different look no further than Gallery Life Accent, an unashamedly bling establishment selling outlandish creations by both established and up and coming artists. Gallery Life Accent does a grand job of pulling you in all directions; it’s hard to know where to settle you eyes. 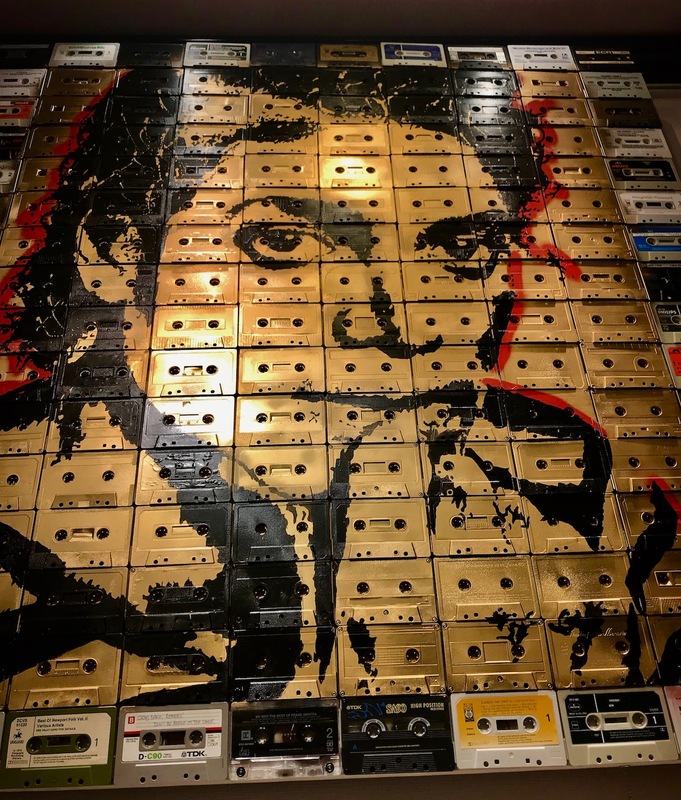 I found myself drawn to this amazing Michael Jackson canvas made from old cassette tapes. The Price tag? Only a whopping 864000KPY (£5,950/€6,950/$7,860). If you think that’s expensive, Gallery Life Accent can easily raise the stakes. 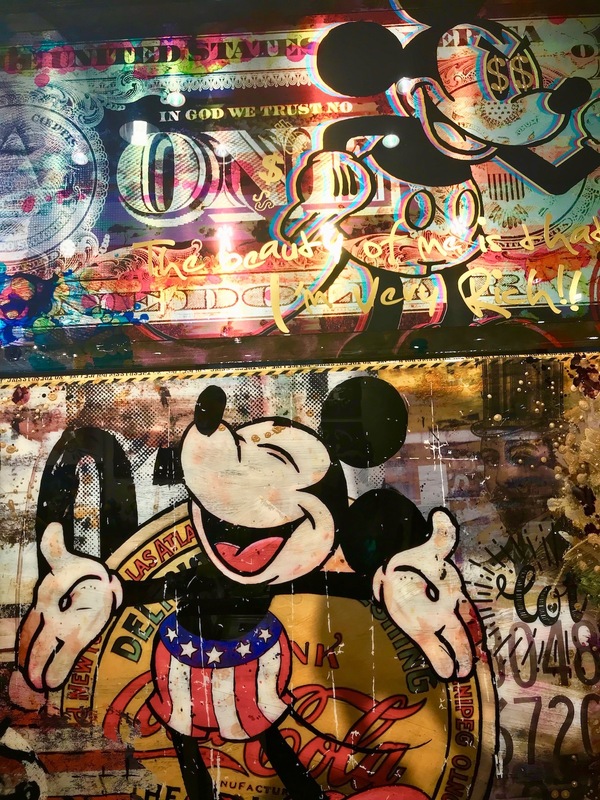 Check out Mickey Coca Cola by James Chiew, a stunning wooden-framed aluminum dibond with multi-layered liquid gloss. Yours to take home for the small matter of 1.650.000JPY (£11,360/€13,280/$15000). Used shoes? Oh. My. God. 3. February 2019. 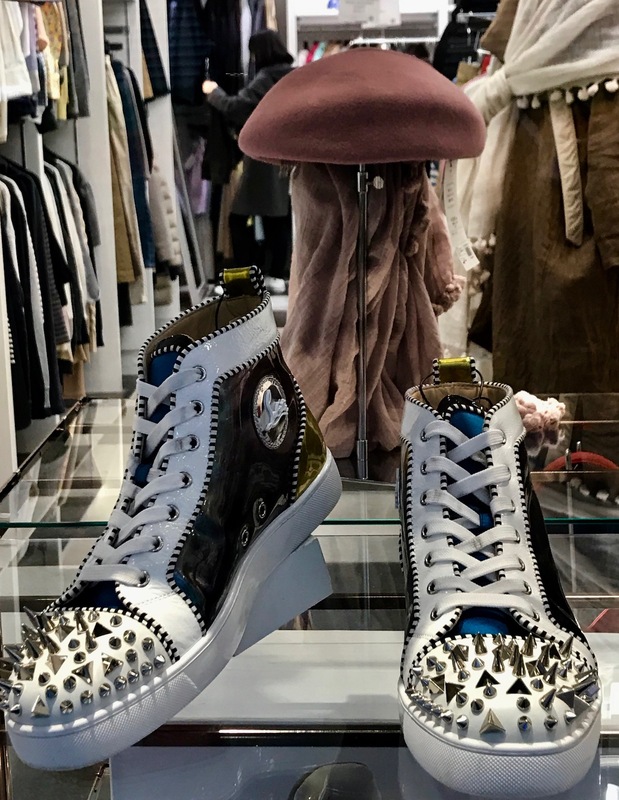 There are no shortages of overpriced clothing and shoes to gawk at too. Even Ginza’s supposedly Used Designer Brand shops (let’s just call it what it is, second hand) manage to up the ante with some simply staggering prices. I spotted these hideous pre-owned boots in a shop window and felt compelled to actually pop inside to pull out the sticker and see how much they were: 127.500JPY (£880/€1.025/$1.160). 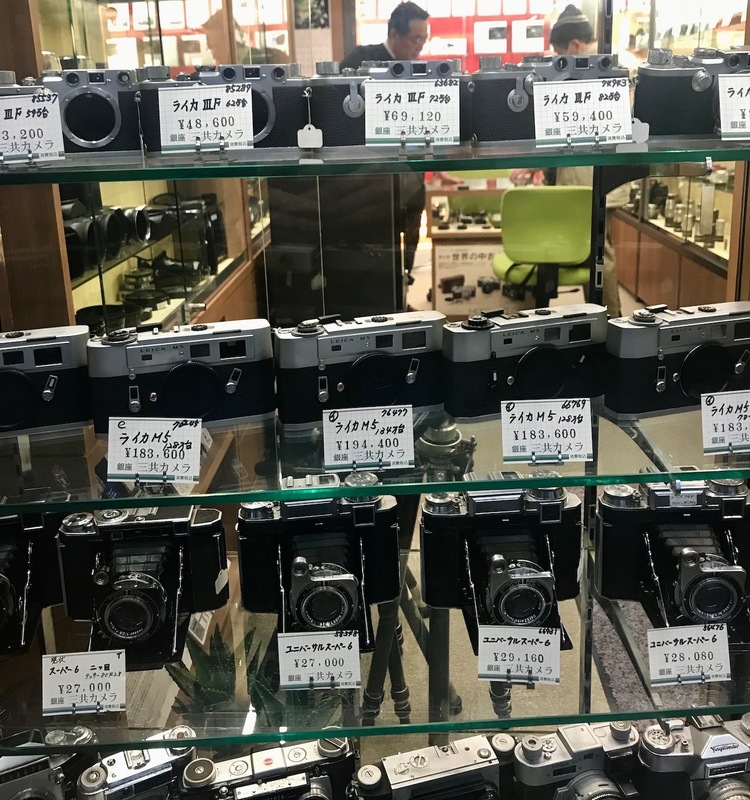 Happily things seemed much more reasonable in Sankyo Camera, a modest store focusing mainly on retro models. Opened in 1957, these guys are famed in Tokyo for their great customer service and going above and beyond to get you that hard to find accessory. 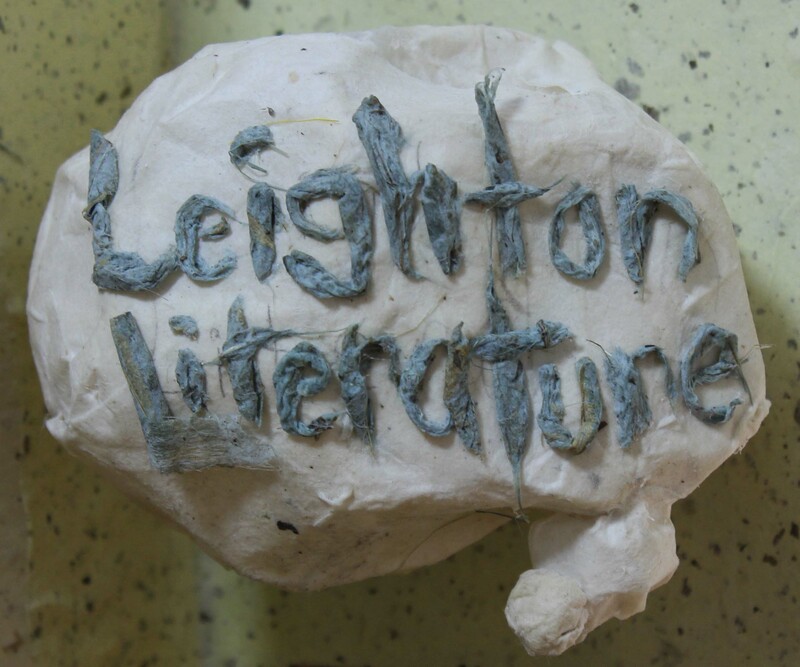 Look out for the junk box outside the front door where there are low-cost and sometimes even free bits and bobs up for grabs! 4. February 2019. 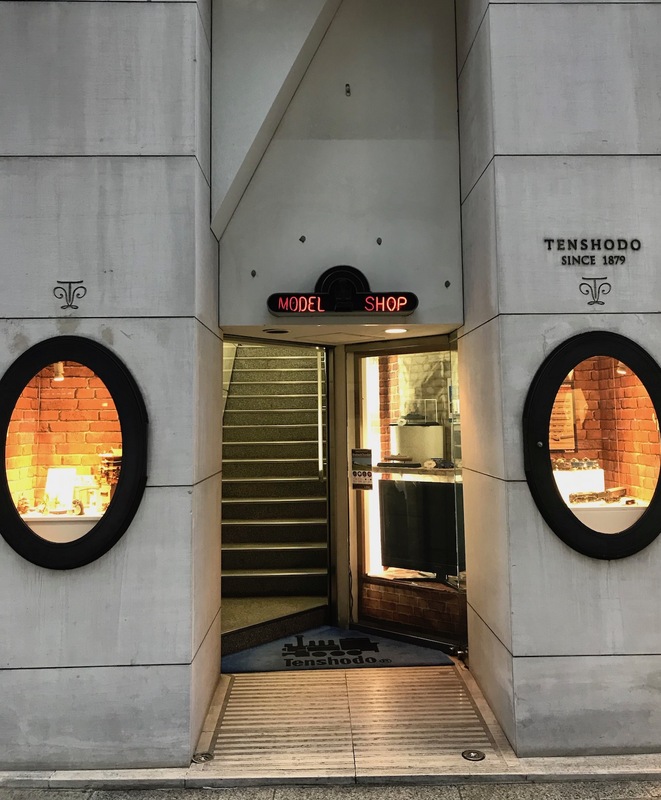 Perhaps our greatest Ginza discovery that afternoon was the fantastic Tenshodo Model Shop, a world famous establishment dating back to 1879! 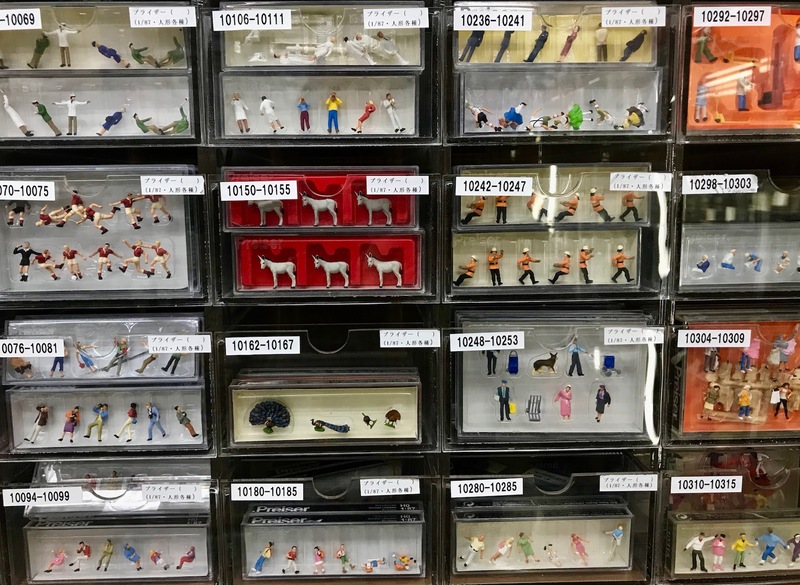 For model train and village collectors Tenshodo has become a major pilgrimage for people from all over the world and inside you’ll see amazing model trains and other cool vehicles. They also have a repair shop where I saw a technician dude test running a model train. It was also fun to peer into their model village drawers, featuring everything from construction workers, families, tourists and farmyard animals to football players, train conductors, trees, benches, garbage bins, lampposts and more. Once again, in keeping with the Ginza vibe, these knick knacks were not cheap! But it was Wonderboy who loved Tenshodo Model Shop the most. 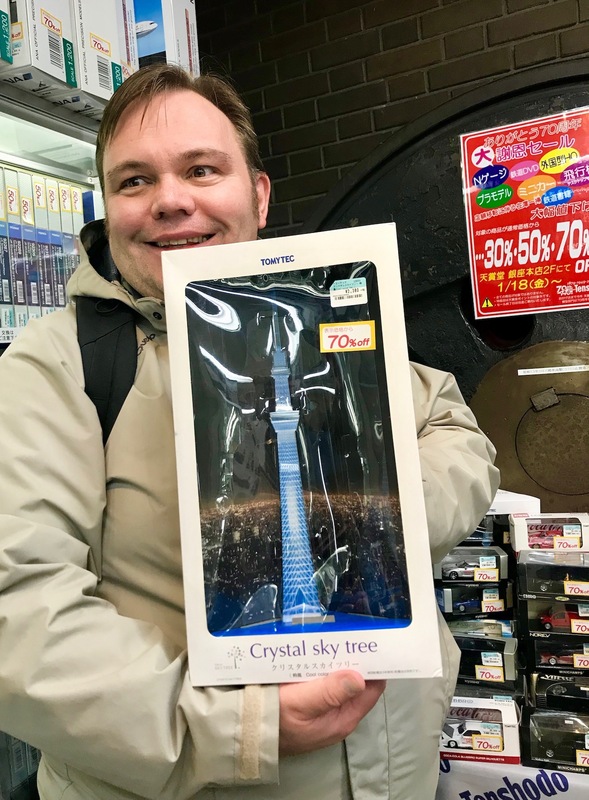 He’d been digging around the sale table when he came across a model of the Tokyo Skytree. Its original price of 2380JPY (£16.40/€19/$21.60) actually seemed reasonable enough to begin with, but this particular box came with a 70% off sticker! BARGAIN! February 2019. 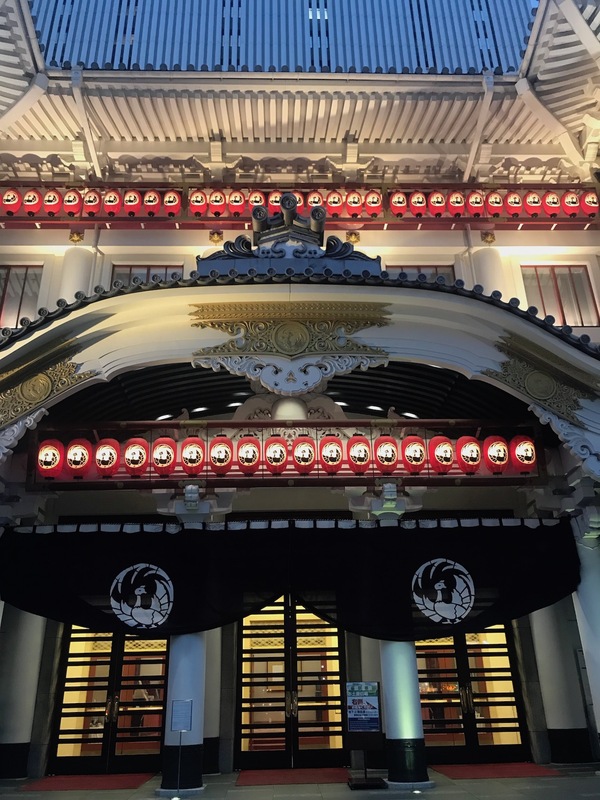 Ginza’s main tourist attraction is the city’s legendary Kabukiza Theatre, a handsome old building located just a 1-minute walk from Exit 3 of Higashi-ginza Station (Tokyo Metro Hibiya Line/Toei Asakusa Line). 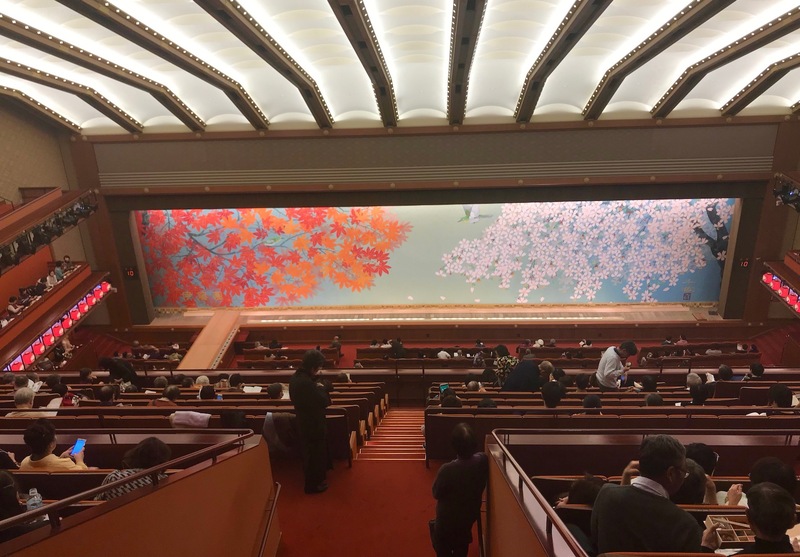 This is the venue for watching Kabuki, one of Japan’s most traditional performing arts and a truly quintessential thing to do while in the capital.